A research collaboration between the University of Reading and the James Hutton Institute has examined the potential of satellite-based remote sensing to provide estimates of annual carbon exchange between peatlands and the atmosphere, with added advantages in terms of cost, spatial coverage and accessibility to remote locations. In the study, researchers describe how remote sensing can help to assess ecosystem carbon fluxes and explain the range of satellite data available for such estimations, while also highlighting cautionary issues which must be accommodated when using these methods in a peatland habitat. 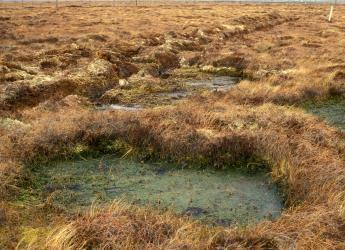 The paper concludes that the application of remote sensing to models of carbon fluxes is a viable research method over Northern peatlands, but further work is needed to develop more comprehensive carbon cycle models and to improve the long-term reliability of models, particularly on peatland sites undergoing restoration. The study Potential for using remote sensing to estimate carbon fluxes across northern peatlands – A review, by KJ Lees, T Quaife, R Artz, M Khomik and JM Clark, is in the volume 615 of Science of The Total Environment, 15th February 2018, pages 857 to 854. The research was funded by the Natural Environment Research Council and the Scottish Government Strategic Research Programme.